Faux reticello is a very clever invention. 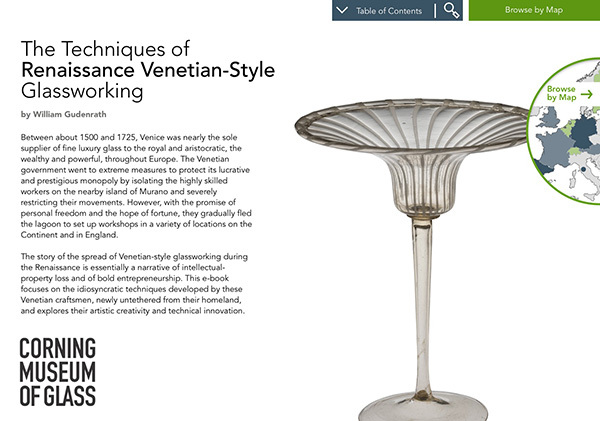 It may be that of a Venetian worker or a Venetian worker working in another country, probably in the 17th century. At any rate, faux reticello is a way of making a very difficult, laborious process quicker and easier. First, a look at true reticello as practiced in the late 17th or early 18th century. 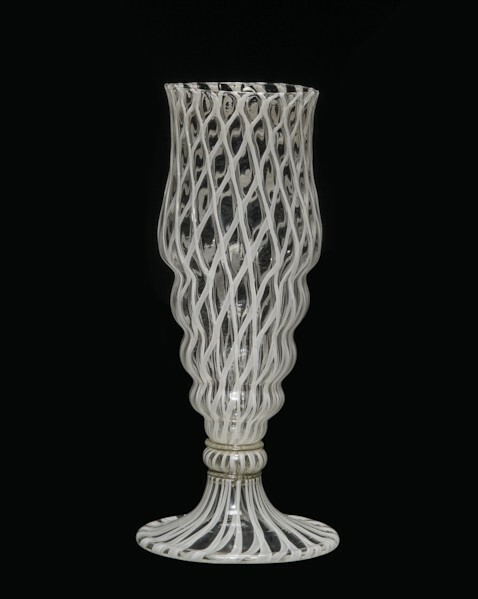 Reticello begins with a cane pull, and reticello canes are traditionally a thin thread of white glass with a very thick layer of clear. The canes are cut to length, placed on a ceramic plate, and heated. The canes are rolled up, and a cup is formed. The cup is twisted in one direction. The process is repeated, and the insert is lowered and the two are blown together. After reheating, the glassblowing begins. In faux reticello, fewer canes are added, and they’re added to the exterior of a bubble. The canes are held upright in a metal mold. They’re preheated so that they stick to the bubble. After reheating, the canes are further pressed onto the surface of the glass. A constriction is made at the end, and twisting begins. The twisting is begun on the marver. By marvering in place, the friction causes torque, which twists the canes. The canes are further twisted. Excess glass is trimmed off the tip, and this is lowered into another mold with another set of canes. The newly added canes are reheated, marvering takes place, and the newly added canes are twisted in the opposite direction. And the visual effect is that of a net. The word reticello, in Italian, means “net glass.” Glassblowing can continue, and the vessel is formed. One of the differences between faux reticello and true reticello is that there are no bubbles at the intersections of the four canes.